I can never understand how a parent can live in a double storey home with their child or children (and with or without pets) and not baby proof their home…. Do you want your child to fall down the stairs? Do you want your child to go into rooms of the house where they could danger themselves? In today’s world, there are so many products on the market to help you secure your child’s safety, and these products are must for all of us that have children that have started to crawl and walk. It only takes a few minutes of us not looking over them for them to get into mischief around the home. 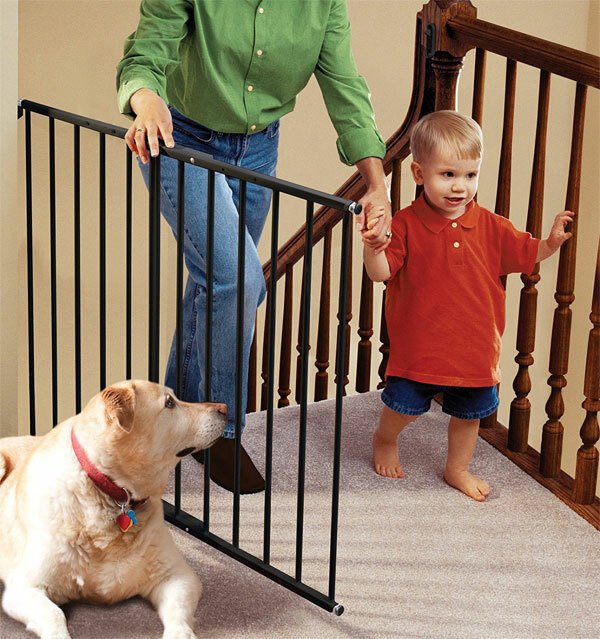 Reduce any chance of injuries by placing baby gates around your home. A baby gate is not just for stairways, it can be for external doors as well. Remember, when your child starts crawling/walking, he or she will explore! That’s when a baby gate is a must in your house! I needed to do some research about baby gates because I wanted the best for my baby when she started crawling. I was so surprised when I saw all the factors you need to consider when buying a gate. I thought I would just go to my nearest baby store and buy a baby gate. How difficult could that be right??? Well, let me tell you – it is damn difficult! Believe me, you tend to forget what to keep in mind when buying these gates (where you want to place the gates, how many gates you need, all the stairs here and there, the open fireplaces and all the external doors), do you buy white or black to match your décor (and YES I wanted the gates to match the décor in the house 🙂 ), normal baby gates or the one you can extent, short gates or high gates?… All these factors plays a big role in your decision. The most important thing to do around your house when your baby starts crawling is to baby proof the house (baby gates, electrical point plugs, etc.). And today I will give you some advice of the top safest baby gates available and what to look for when buying one. Best thing is, you can order these baby gates online and they get delivered at your door step, so there is no need for you to carry these bulk things from the store to your home. Where will you put the gate? Do not install a gate at the top of stairs if the gate has a bottom rail – this can cause you to trip! Also, do not fit a tension-fit gate between a wall and stairway railing post. Gates that are tension-fitted require walls on each side. You don’t want your child to figure out how to open the gate, so I recommend you get a gate where the locking mechanism is child-proof. Examples of gates that are not child-proofed – gates with a button lock or lift-open mechanism. If you have pets and want to keep them in certain areas, try wooden expanding gates or gates with pressure locking bars. But, remember, your child is not an animal (even if they sometimes act like one), so avoid these gates. These gates increase the risk of finger pinching. Measure your doorway before buying a baby gate. You get gates that come with extensions and some that do not have extensions. I’ve saved the best till last! 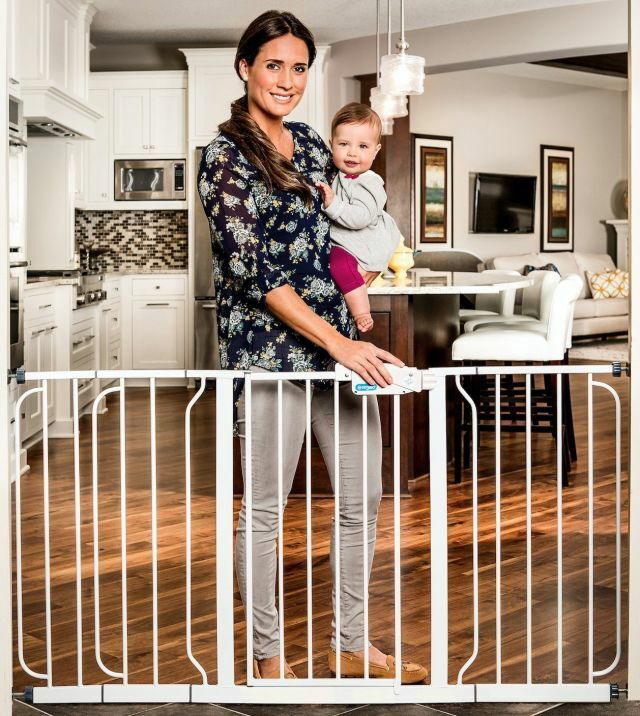 This gate is rated the best baby gate for 2018. As mentioned before, you can get gates that are tension-fit gates and this gate is an example of one. It means that there is no assembly required. 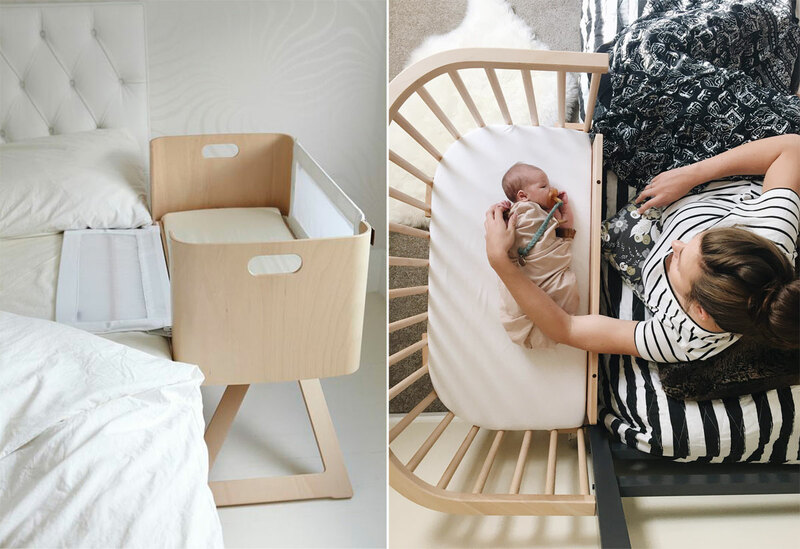 You will get wall cups in the packaging and these cups helps to hold the tension arms in place, thus if your baby pushes or pulls the gate, the gate won’t slip. You can read below where this gate is recommended to be placed. You can either screw in the wall cups into the wall or stick it with double-sided tape. This gate is not recommended for use at the top of stairs. There is 2 ways of opening this gate – lifting the gate to open and twisting the lock for. The great thing about this gate is, is that is swings open both directions! Like the first gate, this one is also a tension-fit gate. It has a child-proof locking mechanism and can be opened with one hand. The opening is a little wider than the other gates, at 18″. You can buy extensions from Amazon.com if your doorway is wider than the normal size door. I’ve included another awesome feature of this product below. Another awesome benefit of this product is that has an indicator and it will flash a red light if you did not closed the gate properly. The gate can be used between door and at the top and bottom of stairs the BEST advantage of this gate is that is has 2 locks – the top one you open with a slide lock and then you must pull the gate to unlock the bottom lock at the step-over step. This gate is also perfect for animals (just a tip). Kidco Safeway Satety Gate was nominated the best “top of the stairs” gate for 2018. Impressive hey?J Advantages of this gate : no step-over bar, the reviews are 100% excellent and you can operation the gate with one hand (if your in the octopus situation LOL). I’ve included some other critical elements of this gate below. The lock is quite easy to use, but not too easy for a toddler to figure out 🙂 It has a pretty amazing feature, which I have explained below. A pretty cool feature this gate has is that the lock has an indicator to tell you if the gate is locked securely or not. Amazing right? You will use 2 screw-mounts to mount into a surface. The gate can open in both directions. And last but not least are the best ever, best selling, top rated and most talked about baby gates. This brand has got baby gates down to a perfect art. Read below details about their hottest products. 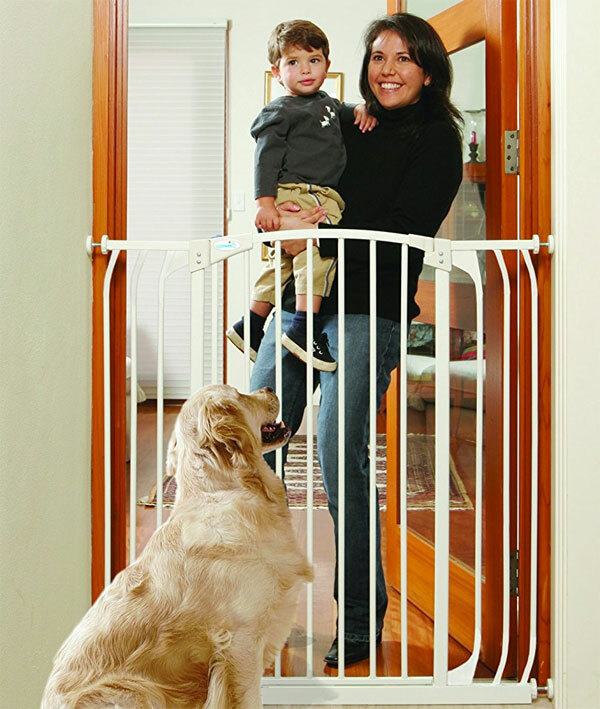 Regalo has two baby gate products that are very popular. They include the Regalo Easy Step Walk Thru Gate which is their standard gate that fits Spaces between 29″ to 39″ Wide or the Regalo Extra WideSpan Walk Through Safety Gate which expands to fit openings between 29”-58” with 6”, 8” and 12” extensions included and Stands 30” tall. 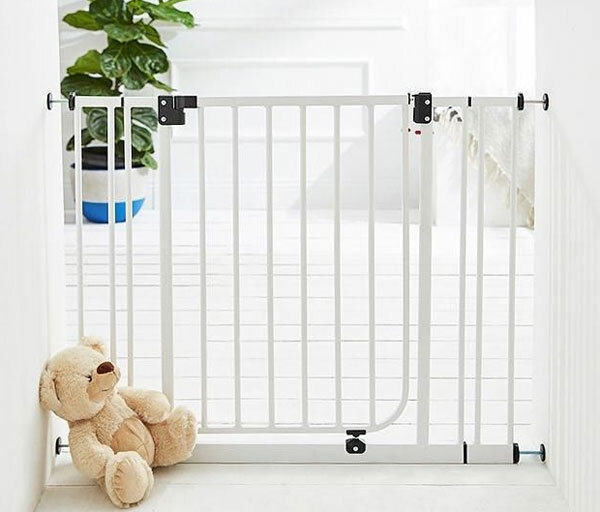 Do your research before buying a baby gate because you want to keep your baby safe, and remember cheap is not always the best. 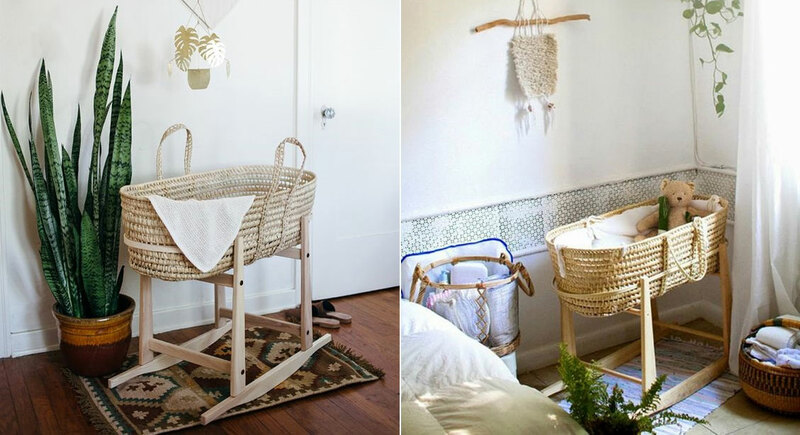 Rather, pay more for something you know is perfect for your house and your baby. 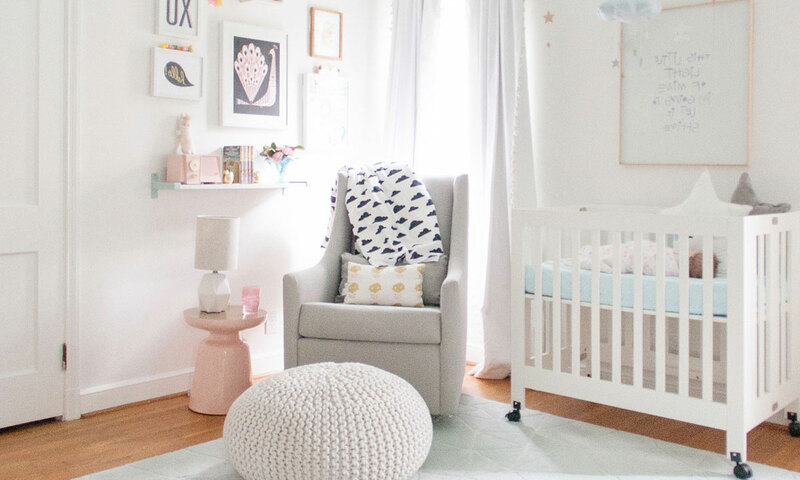 ← From What Age Should Your Baby Sleep With a Pillow?